Microsoft’s new CEO Satya Nadella took the stage yesterday to introduce the company’s new Surface Pro 3. 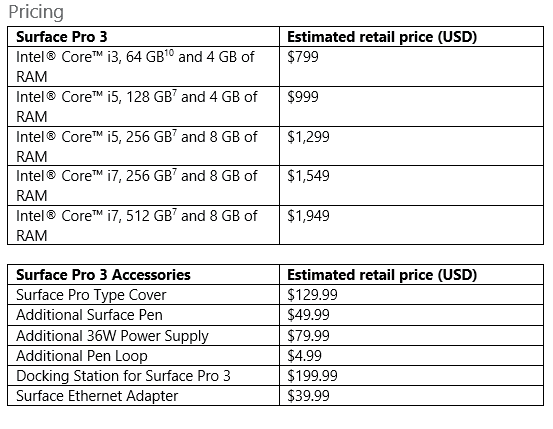 Here’s the details as well as prices for preorder. Microsoft’s new CEO Satya Nadella took the stage yesterday to introduce the company’s new Surface Pro 3, which the company is touting as the tablet that can replace your laptop. Originally it was thought that Microsoft would announce a Surface-mini around 8-inches at this event. As the date got closer, rumblings about a larger 12” Surface began to leak out as we reported yesterday. Well, it turns out the rumors of a larger Surface were true. It looks like Microsoft decided to not address the mini tablet market, as there’s already small form factor tablets running Windows 8.1 available like the Dell Venue 8 Pro or the Lenovo Mixx 2. Instead, the company is addressing a need that its partner’s aren’t meeting — a top of the line Windows 8.1 device. Here’s a look at what was announced yesterday at the Surface event, and more details on what you can expect to see later next month. 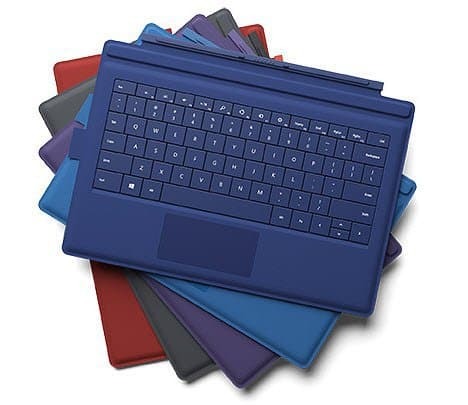 The Surface has come a long way since the debut of the Surface RT which was launched in October of 2012 – the Pro version came several months later in February of 2013. The first iteration of the Surface – both pro and RT were definitely that of a first gen device. What I mean by that is the concept of was cool and exciting. However, the actual hardware, and software, depending on your opinion of Windows RT, needed a lot of work. Now Microsoft seems to have created a top of the line product that will compete with the likes of Apple’s MacBook Pro and MacBook Air. It runs Windows 8.1 Pro – the full version, not RT. It weighs in at a light 1.76 lbs., (almost half of the 13-inch MacBook Air) and the casing is magnesium with a silver cover. You can get it in various storage sizes from the low 64GB all the way up to 512GB. You can get it with a 4th-generation Intel Core i3, i5, or the top of the line i7 CPU. All models will have either 4 or 8GB of RAM. The new Surface has three important ports, including a full-size USB 3.0, a microSD slot to add more storage space, and mini display port to send your screen to an external display. It also has ports for the charger and a headphone jack. It sports a 12-inch screen with the display coming in at a resolution of 2160 x 1440. Of course the screen is touch enabled, and it comes with an input pen. The input pen is much smarter than you run-of-the-mill stylus. It allows you to launch specific apps. For example, touch it to the screen, OneNote launches. Clicking the pen will save what you’ve written in OneNote, and double clicking it with the camera open will snap a photo and allow you to write on it, again via OneNote. Developers should be able to come up with some cool use cases for the pen in their apps. And it has 256 levels of pressure sensitivity… meaning it will respond accordingly to how hard you’re pressing down on it. Surface Pro 3 has 5MP 1080p front and rear facing cameras. built in front and rear facing microphones and Dolby Audio-enhanced stereo speakers that are said to be much louder and better sounding that the two previous Surface models. Of course, small tablet or laptop speakers aren’t going to fill out a room or anything. This Surface has the longing lasting battery which promises up to nine hours of web-browsing life. Of course your mileage will vary depending on the types of programs and apps you’re running. The new Type Cover, which is sold separately, is obviously bigger to cover the 12-inch screen, although the keyboard is still the same size. Overall it’s thinner and the keys are said to be even more responsive. Another interesting feature is you can snap the cover to the bottom of the tablet which stabilizes it, and make it better experience when typing with it in your lap. But the most notable improvement is the (68%) larger one-piece trackpad that supports all Windows 8 gestures and is easier to use. Of course we won’t know for sure until getting some hands-on time with it, but I can tell you that the trackpad on my current Type Cover is painful to use. Most of the time I use an external mouse. And of course, like the previous ones, the Type Covers come in various colors. 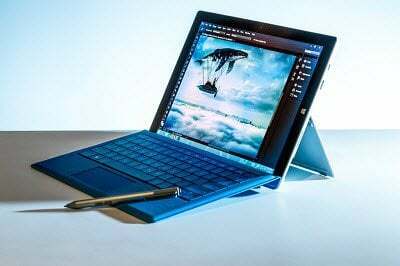 The Surface Pro is available for pre-order today, and will begin shipping on June 20th. 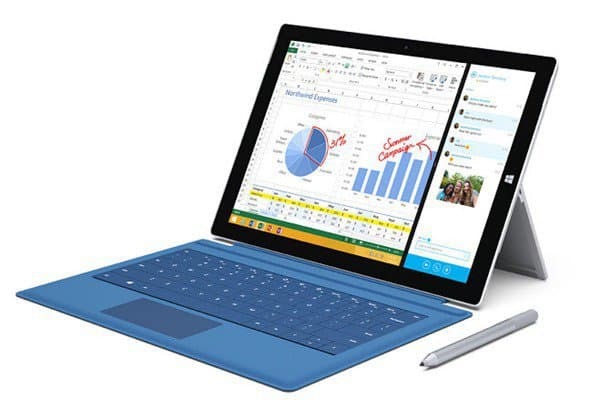 Keep in mind though that, like with the first two batches of Surfaces’ the Type Cover is sold separately for $129.99. Love the evolution of the device. Glad to see the progress made to make it thinner and lighter. I think Microsoft is definitely getting closer on this one.